Seven years ago, I signed my then five year-old son up for soccer with the local league – the Westchase Soccer Association (“WSA”). Having played soccer my whole life, I figured I would give coaching a shot. Unbeknownst to me at the time, that decision to coach would change my life. Over the years that would follow, I would be blessed to meet extraordinary kids, give them a little guidance about how to play the game and then cheer them on from the sidelines every Saturday. The kids and I have grown up together through the various ascending age groups. I’ve gotten to know their parents, I’ve been able to cheer on my former players at school functions and I’ve watched those kids blossom into magnificent young men and women. Unfortunately, there has always been this inevitability that it would all end someday, as WSA did not go past the U12 division. As the 2016 season loomed, that day had apparently come. Fortune smiled. 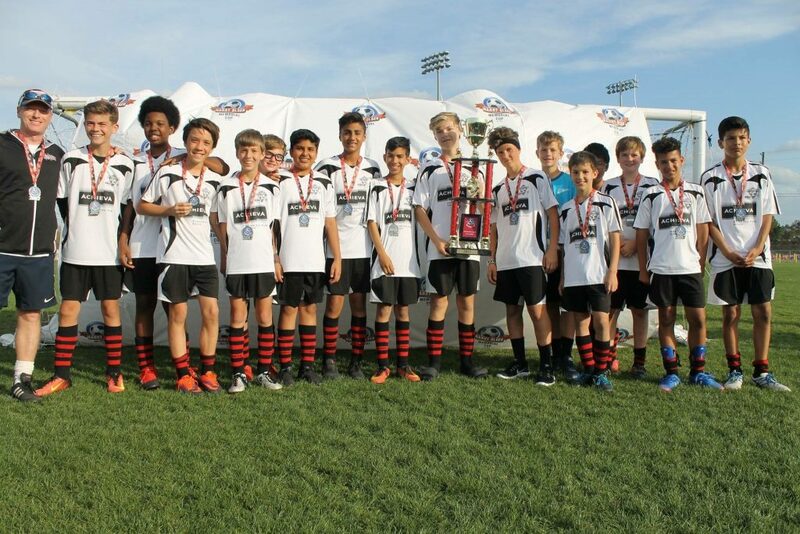 In the summer of 2016, I got a call from the league president that WSA wanted to open an in-house U-14 division and also put together a travel recreational team (known as its “TARSA” team). Incredibly, I was asked if I wanted to coach the TARSA team and before the question was completed I had said, “Yes!” One year later, I find myself so profoundly grateful to WSA that I was given this opportunity. Our team – affectionately known as the Westchase Force – had the season of a lifetime. We went 10-2 in league play, made it to the semifinals of the end of season playoffs (out of 27 teams), got to the finals of the Harry Olsen Memorial Cup by scoring with 10 seconds left in the knockout game and was one of two teams awarded a spot in the Game Day of Champions exhibition at the USF complex. Our calling card became our last second heroics. No fewer than four times this season, we scored to win or tie within the very last seconds of play. It wasn’t all roses, though. My son fractured his arm while playing goalkeeper on the first shot of the season (the first of several fractures on our team), our striker was on crutches for the last game of the season because of a very dirty play by a player from a Miami team (but he scored before he was fouled! ), our captain suffered immeasurable back pain through the majority of the season leaving him lying on the ground several times after the final whistle and, by the end of the campaign, we were left hobbled, aching and exhausted. And it was wonderful. The beauty of team sports is that when you have a special group of players, like we did, you pull together when times get tough. The brotherhood that our boys felt for each other this season was palpable. They genuinely cared about each other. When one was injured, the next man stepped up. The bond that they developed over an eight month span will be with them forever. Those moments that they shared will never go away. I have the benefit of age to know how special this season was. Those kids have the benefit of youth to believe that the best is yet to come. Odds are, we are both right. If you have a youngster interested in soccer, get him or her into this league. If you have an ounce of coaching ability, sign up to be a coach or an assistant coach. It could literally change your life like it has mine. Thank you to WSA for all of the years of joy you have provided my son, my daughter, my wife and me. Your tireless work to make this league special does not go unnoticed. Thank you also to all of the wonderful parents, especially the amazing group from our TARSA team this past season. And, of course, thank you to the past and current members of the Westchase Force. You all hold a very special place in my heart and always will.